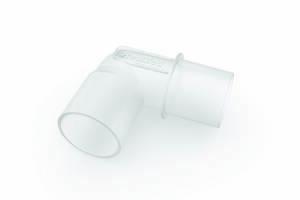 One replacement 90-degree elbow adapter for the ResMed AirSense series CPAP / VPAP machines. These machines have the tubing outlet at the back of the machine, so this adapter makes is more convenient to connect a breathing tube and route it to the patient. This adapter will work with the standard ResMed Slimline tubing and most other types of standard breathing tubes; however, it will NOT work with the ClimateLine heated tubing, because that tubing has an elbow built into it and also has provisions for the heating element connection. Received as expected, original part.